Directions to Stop #4: From the Mine Creek State Historic Site get headed east on State Highway 52. When you reach US Highway 69, turn right (south). After traveling south on US Highway 69 for about 7.5 miles you will cross the Linn / Bourbon County Line [ Waypoint N38 02.231 W94 42.456 ]. Remember that Price's Army was continuing its retreat down the Fort Scott Road. The Fort Scott Road followed a route west of the present day US Highway 69. But near the county line, its path crossed US Hwy 69 and continued east of the present day highway on the way down to Fort Scott, Kansas. This tour stop is located near Fulton, Kansas 66738. Continue on US Hwy 69 for another 2.8 miles until you reach the exit for Wagon Road. Take this exit and turn right (west) and travel for 0.4 miles until you reach State Highway 31. Turn right (north) and travel for about one mile, turning right (east) on Xavier Road. Follow this road for about one mile to the Little Osage River. 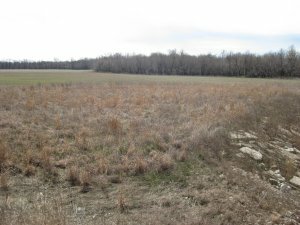 Description: Around 1:00 P.M. on October 25th, it was near here that the Confederate wagon train was crossing the ford over the Little Osage River. 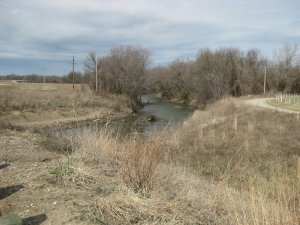 The ford was about 8 miles south-southeast of Mine Creek on the Fort Scott Road. 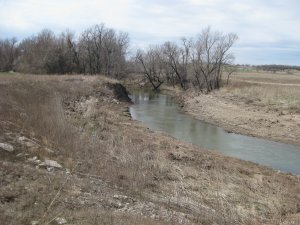 East of this ford, the Old Military Road or Wire Road crossed the Little Osage near Barnesville [ Waypoint = N38 00.469 W94 39.793 ]. Following their defeat at Mine Creek, the panicked men from Marmaduke's and Fagan's Divisions were beginning to show up. Brigadier General Jo Selby reacted by setting up a skirmish line about one or two miles north of the Little Osage River. Shelby set up his lines of defense south of the river with all troops (about 2,000 men) being mounted and straddling the Fort Scott Road. Brigadier General M. Jeff Thompson placed a small group of skirmishers at the ford. Most of the men were armed with rifles, only a few having sabers or pistols. Although victorious, Pleasonton's Division had become very disorganized at Mine Creek. Some units had reached the top of the ridge south of Mine Creek around 1:00 P.M. and saw Shelby's forces forming up to the south. After about a half an hour, the Federals were formed into line of battle. "Being mostly a prairie country the troops of both armies were in full view, and the rapid onward movement of the whole force presented the most extensive, beautiful, and animated view of hostile armies I have ever witnessed. Spread over vast prairies, some moving at full speed in column, some in double lines, and others as skirmishers, groups striving in utmost efforts, and shifting as occasion required, wile the great clouds of living masses moved steadily southward, presented a picture of prairie scenery such as neither man nor pencil can delineate." Around 2:00 P.M. Pleasonton ordered McNeil to charge with Sanborn supporting on his right. Philips had run into the river and had to stop a mile or so above the ford. The waiting Confederates let loose a volley when the charging Federals were about 100 yards from their first defense line. Then they quickly withdrew past the second defensive line which let loose a volley against the charging Federals. The second line quickly withdrew from the charging Federals. Thompson was able to get the fleeing Confederates reformed behind a deep creek just south of the ford. McNeil charged the Confederate position and after 15 to 20 minutes was able to drive them back to a hill about a half mile away. By now Philips' and Benteen's Brigades had gotten across the Little Osage River and were coming up to support the attack. McNeil and Sanborn attacked again. Confederate General Thompson had his men fire another volley before withdrawing. The Confederates were stubbornly resisting as they withdrew south to the Marmaton River. The Federals' horses had become exhausted and could not make a satisfactory charge. By 3:00 P.M. the fighting had pretty much stopped. Casualties were light.